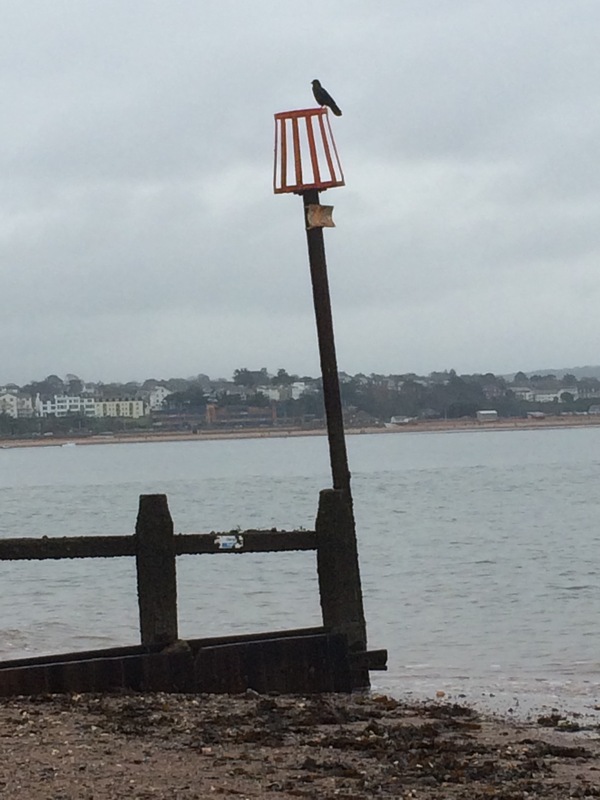 Our second alphabet date was beachcombing on the Exe Estuary at Dawlish Warren. 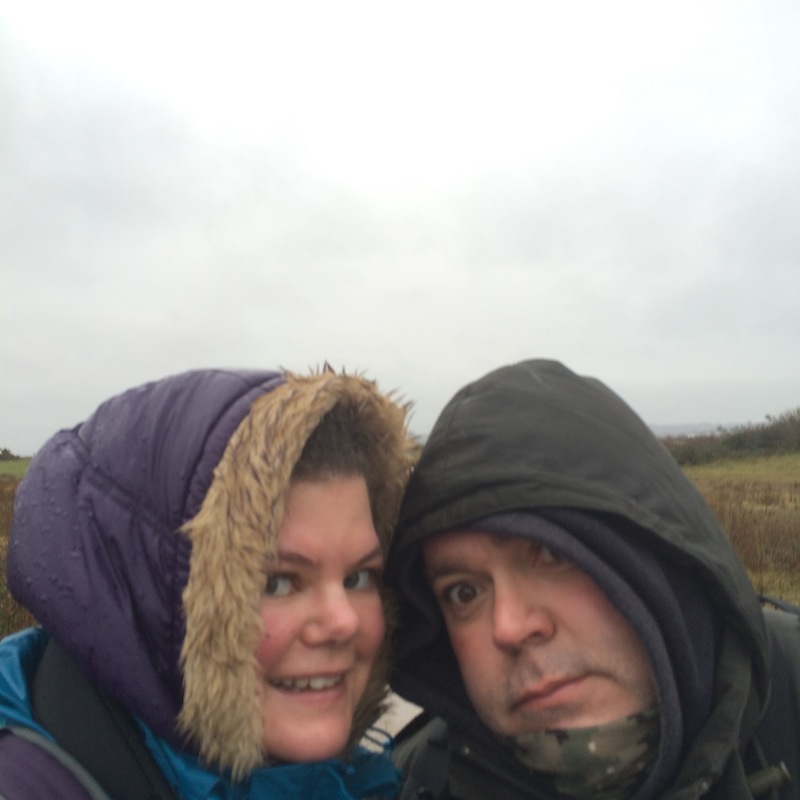 We live in Berkshire, a reasonable distance from the sea. 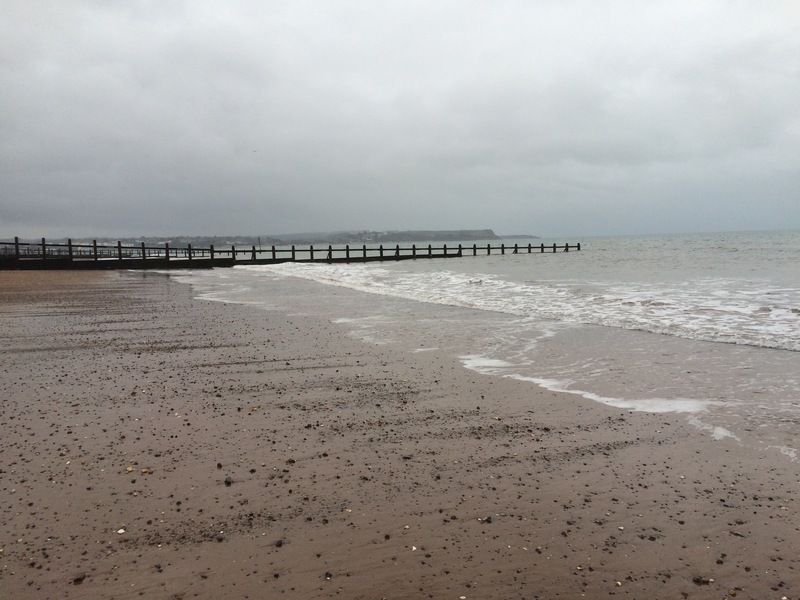 A New Year’s break in Devon provided the perfect opportunity to spend time by the sea. 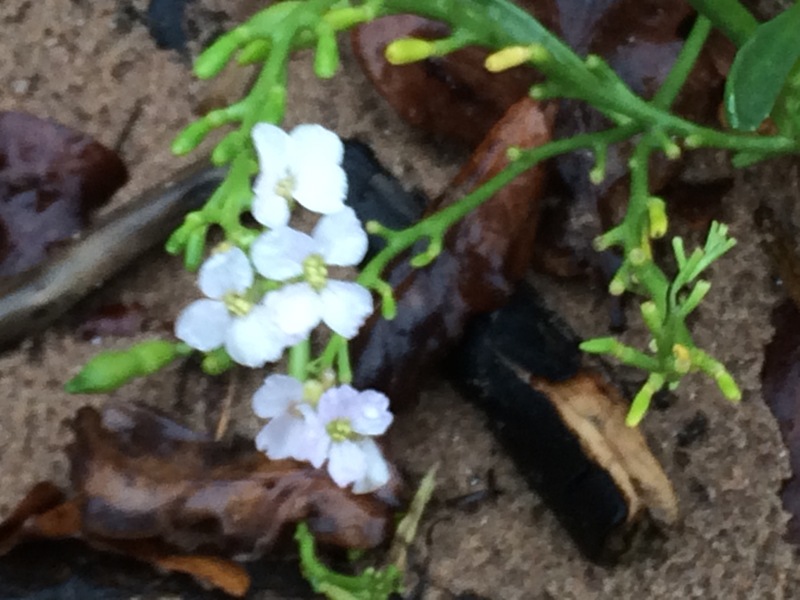 New Year’s Day dawned gloomy and damp, but undeterred we headed to the beach. 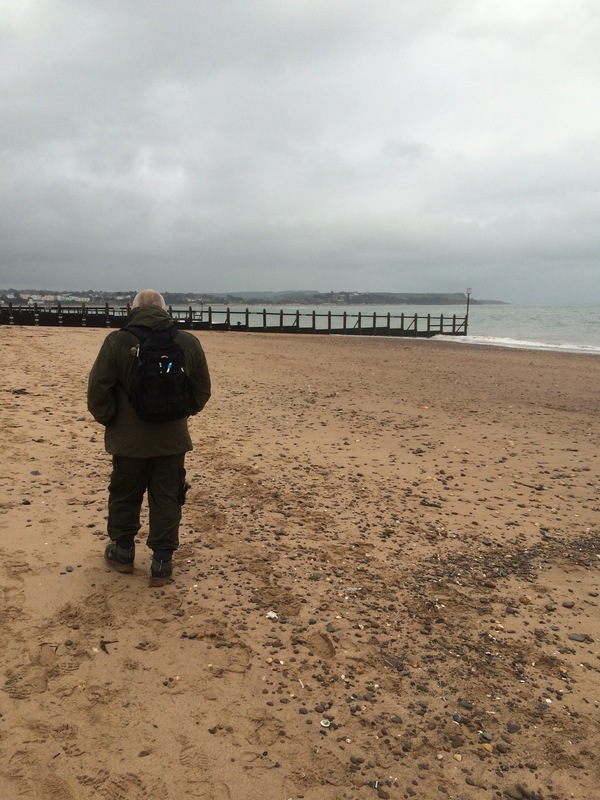 We walked along the front, onto the sandy beach and wandered along. 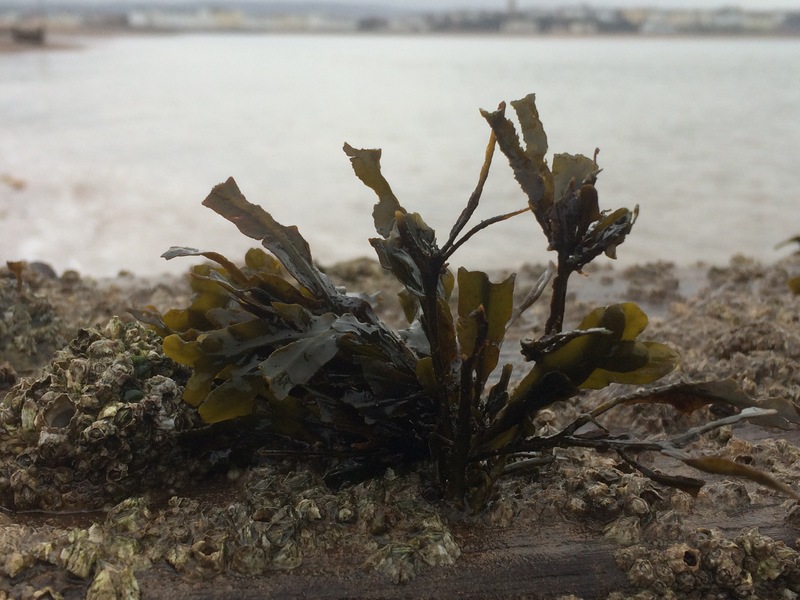 The weather worsened, but the sea air was fresh, shells and seaweed dotted the shoreline and we were warm and dry in our winter clothes. Along the shore dark bellies Brent geese swam, great black backed gulls swooped and dived among the gentle sweeping waves. On the end of the groynes corvina rested before alighting to play in the wind. Oystercatchers dabbled on the shore, their red beaks bright against that dullness of the day. 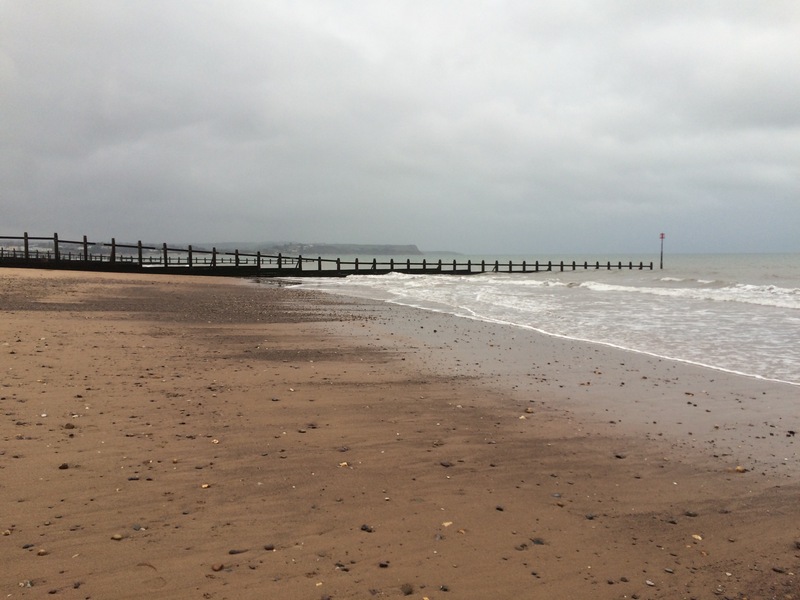 We walked closer to the shoreline, watching the pattern of the waves to time our dashes round the base of the groynes to avoid a soaking. Eyes on the shore we spotted sea glass, and hag stones with holes in them. 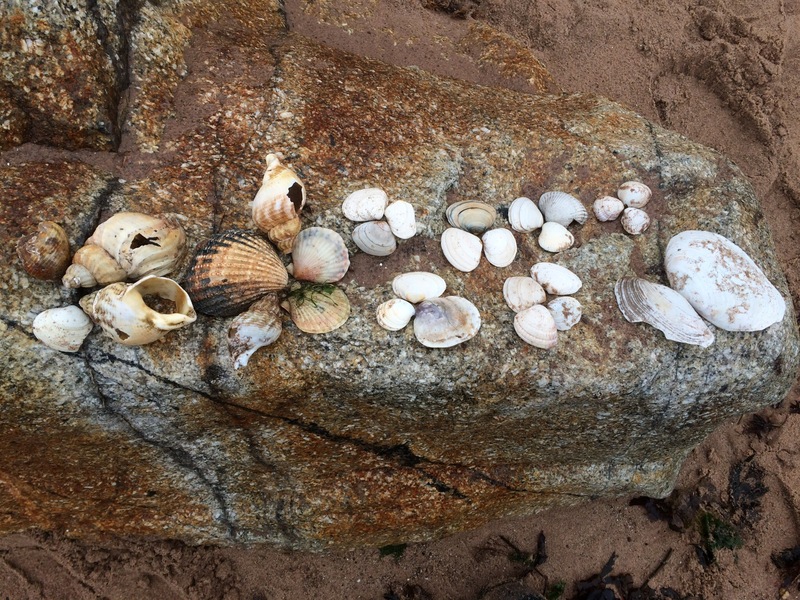 These are now hanging in our kitchen with others we have collected, a reminder of happy times by the seaside. 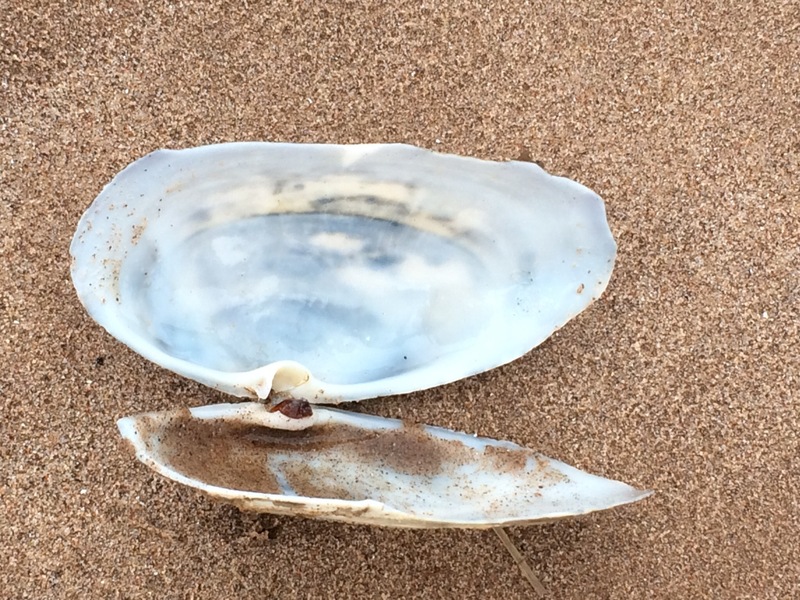 Shells were in abundance on the shore, different shapes and sizes. 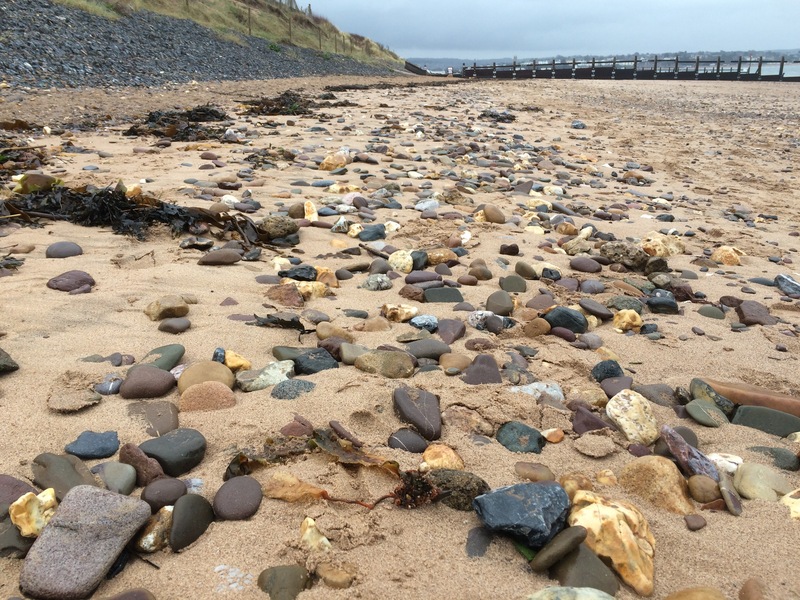 Someone had left a pile on a large rock, part of the sea defences on the back of the beach. We sipped a coffee to warm up while admiring them. 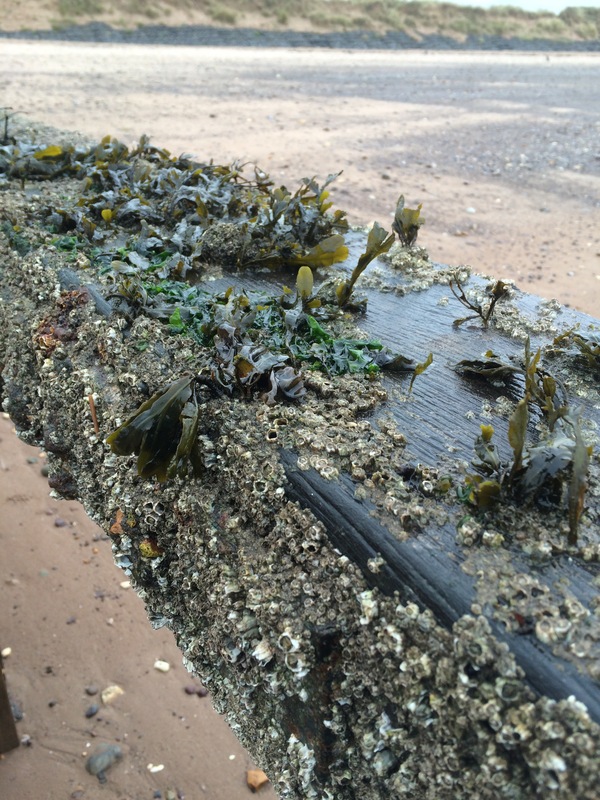 The groynes were rough with barnacles, seaweed sprouting on the bare wood. 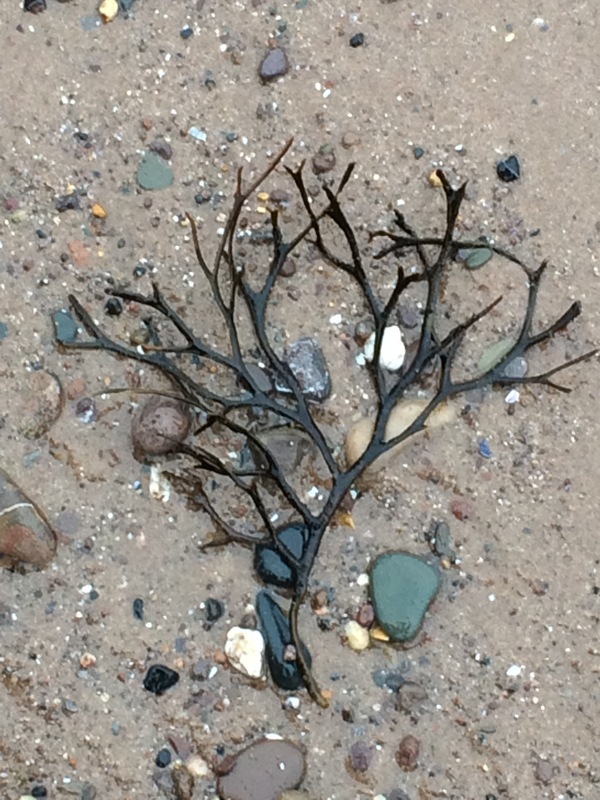 Seaweed spread out on the sand, fronds spread, a marine tree marooned on the shore. 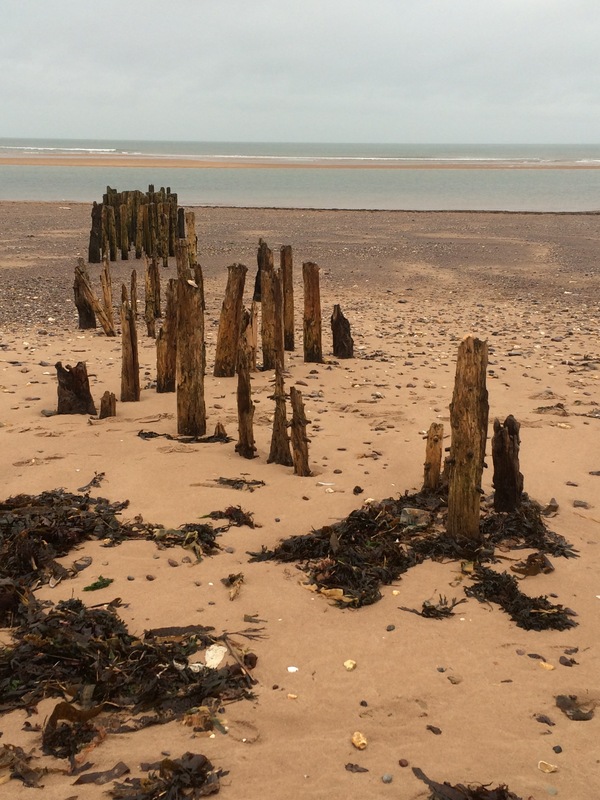 Further along the beach abandoned groynes stood, like a woodhenge leading ancient pilgrims to worship in the sea. 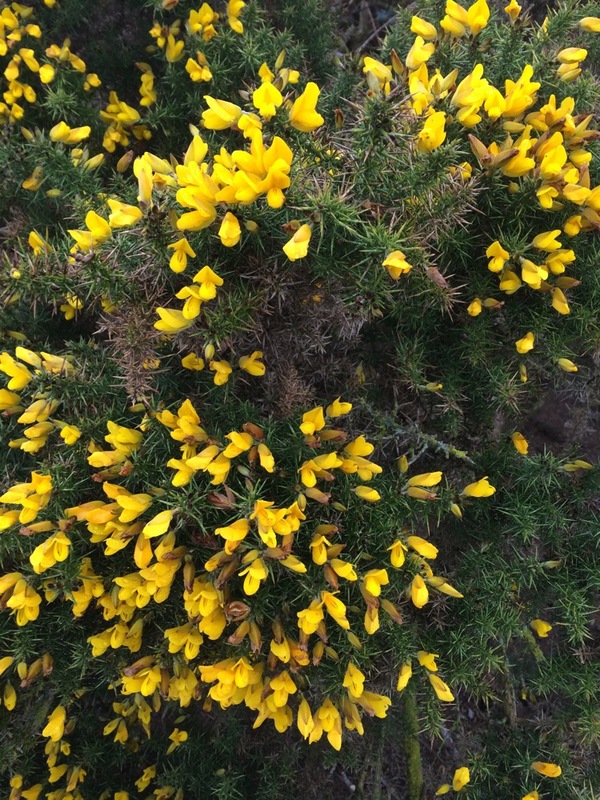 Despite being midwinter, flowers bloomed in the dunes, the promise of Spring on an increasingly wild winter’s day. 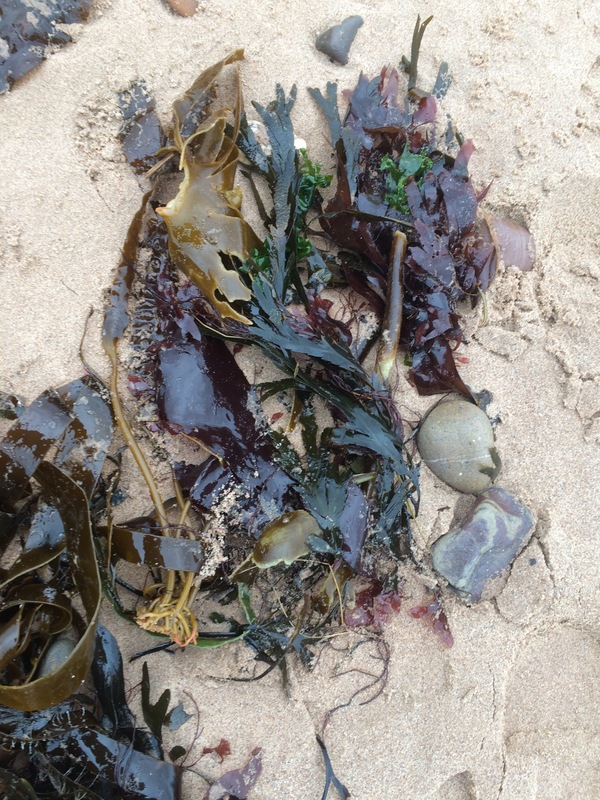 We returned to the car, pockets lined with sea glass, hagstones and sea shells, soaked to the skin and sandy, but happy. An exhilarating seashore trip was the perfect way to start the year. 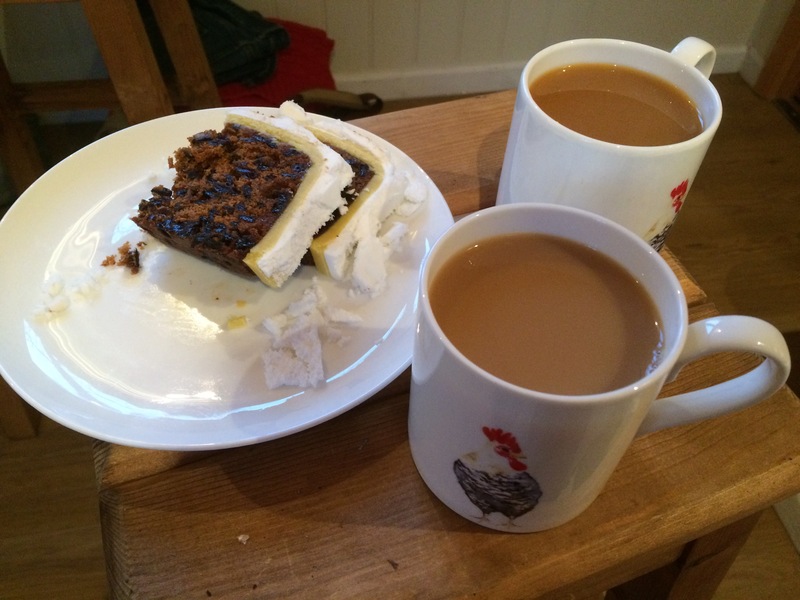 Back in our shepherd’s hut we warmed ourselves with a well deserved coffee and munched on cake. A memorable alphabet date! For our “b” date I also considered bowling, a brewery tour, a boat trip or a booze evening but beachcombing was the perfect date. What would you do for a “b” alphabet date? I would love to hear your ideas.